This Ketubah is a gentle pond of swirling and soothing water colour washes that meditatively meander and move into each other. Gentle and calm, a palette of aquas, emeralds, lilacs, lavenders, turquoise and sky blues sing together; harmonically and melodically. 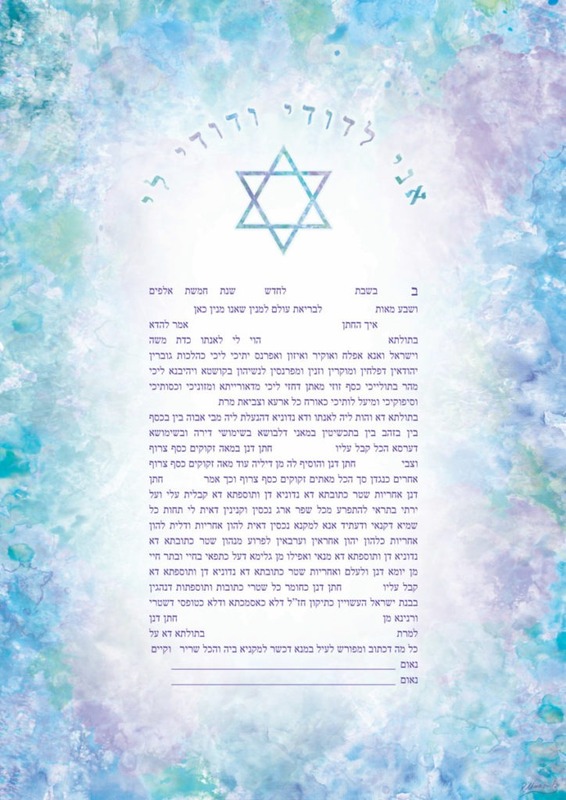 This Ketubah is for a couple drawn to magic, calmness and serenity. The Magen David is painted in a water colour wash that resonates with the aesthetic of the background and emits a white halo. The hymn “אני לדודי ודודי לי” translating as “ I am my Beloved’s and my Beloved is mine” is the most celebrated sentence from Shir HaShirim (Song of Songs 6:3), written by King Solomon as a romantic declaration between husband and wife. Wrapping around the initials, it echoes the shape of an enclosure to foreshadow the future home that will be created by the union of these two souls becoming one. Furthermore this psalm evokes the intrinsic commitment, care and responsibility mutually undertaken by husband and wife in their journey through life’s palette of colour. For any variations of this Ketubah please contact Ryan.